GETTING a good degree requires brains - of course – but also a sense of timing! To help students be in the right place at the right time, MMU is linking the student portal MyMMU direct to their mobiles – downloadable from the Apple App Store now. It means you can now access the portal in real time, giving you 24-7 access to course information, library accounts, university bills and much more. The 'My Course' feature is currently being developed and will eventually provide reminders about hand-in dates and deadlines, your timetable, and access to WebCT and (from 2011) the new Moodle system. The app went live and is downloadable from the UK Apple App Store this week. And for those without an iPhone, don’t worry, you can access MyMMU through a web browser on your Blackberry, Android, Symbian or other mobile. Student Union President Rob Masih-Croll said: "This is a very practical and important step from the University. 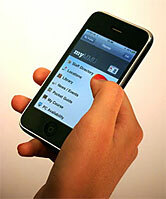 All students have mobile phones and increasingly rely on them for information. "It is important that the University continues to listen to student views on the portal and other learning technologies." Moodle gives students 24/7 off-site access to reading lists, exam papers, recommended book chapters, video, podcasts and more. It will replace WebCT as the University’s official ‘Virtual Learning Environment’ with students enrolling in January 2011, the first to benefit. The technology was implemented via Professor Mark Stubbs and the Learning and Research Technologies team. Previous Story How do executives use the Internet?